Hanoi (VNA) – Vietnam expects to have a total of 54.2 million people in the workforce in the first quarter of 2018, up 150,000 from last year’s final quarter, according to the Ministry of Labour, Invalids and Social Affairs (MoLISA). The ministry announced its quarterly updates on the country’s labour market, Report No.16 for the fourth quarter of 2017 in Hanoi on March 15. 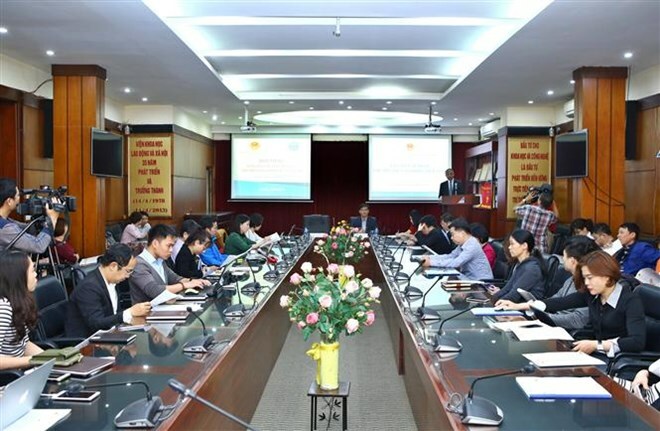 Vietnam posted the economic growth of 7.7 percent in the last quarter, the strongest in many years, which together with increases in newly-registered firms and operating businesses boosted the number of people in work and cut unemployment, said director general of the MoLISA’s Institute of Labour Science and Social Affairs Dao Quang Vinh. Several industries are forecast to experience high growth this quarter, including manufacturing of electronic components, computers and optical products, ore mining, metal production, furniture and wastewater treatment, enhancing labour demand. The number of employed people hit 54.05 million in the fourth quarter of 2017, up 0.53 percent from the previous quarter and 1.21 percent year-on-year. The highest growth was recorded in manufacturing with an increase of 226,000 people, followed by construction, logistics and automotive repair and maintenance service industries. Meanwhile, the number of people working in the agriculture, forestry and fisheries saw the largest decline of 698,000 people from the same period of 2016.